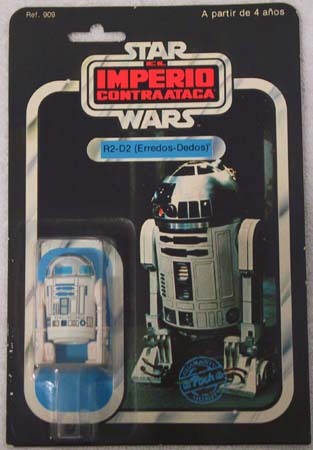 This piece is an R2-D2 (named Erredos-Dedos) released by Spain Star Wars toy licensee PBP Toys around 1981. This piece is particularly interesting for a number of reasons. First the top corners are rounded while the bottom corners are square very similar to most pre-production proof cards and the Droids Boba Fett. The front also features the Poch Toys guarantee logo; the first PBP 31 Backs and early 41 Backs had this logo. Later releases (including later 41 Backs) dropped the Poch logo altogether. These logos were printed in either blue or yellow ink depending on the cardback. Perhaps most interesting is the exclusive to PBP cardback seen below.